At this time of year, gardening is at the bottom of my to-do-list. It is cold outside. Other than shedding leaves, the plants are not doing anything visible that would inspire me to go work outside. The truth is the plants are alive. Just like any other form of life plants, even when they are not actively growing, are physiologically active. If the needs of these living forms are neglected they will show it but usually, it will be too late. The damage will already have been done. Water. The one thing that I need to remind myself is to water my potted plants on a regular basis. The roots of the plants are limited within the soil in the pot and when that soil is dry they have no other source. Plants grown in the ground can grow their roots further just to reach the source of moisture but plants in pots are like animals in cages. Everything they need has to be provided. 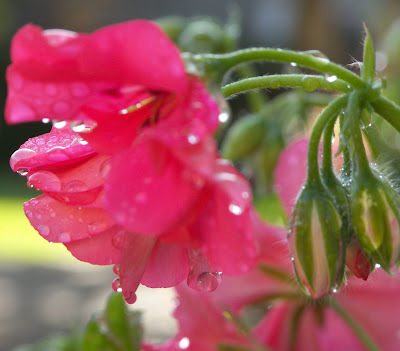 Water also helps the plants withstand freezing temperatures. Shelter. Plants that are sensitive to freezing temperatures need protection during the winter months. Plants in pots are easier to move around than their in-ground counterparts. Move them closer to the buildings or position them in such a way that they will get exposed to the southern sun. The days are very short, it is important to allow the plants to get as much sunlight as possible. Stroll in your garden...it's good for you and your plants. Fertilizer is any soil amendment that is guaranteed to contain a minimum percentage of nitrogen, phosphate or potash. There are two types of fertilizers according to their source: organic and inorganic fertilizer. 1. Organic fertilizers or Manures are soil amendments derived from fully decomposed plant remains and animal excrements and by-products or a combination of both that is guaranteed to contain one or more of the essential nutrients other than carbon (C), hydrogen (H) and oxygen (O). Organic fertilizers generally have low nutrient content, thus significantly large volume is required for application. Based on the cost of nutrient per pound, manure or organic fertilizer is generally expensive. However, organic fertilizers or manures contain a variety of essential micro-nutrients that plant need. They also help improve the physical and chemical properties of the soil by increasing soil organic matter content. Compost, animal manures, green manures, bone meals, fish meals, and blood meals are common examples of organic fertilizers. Even human manure is also a source of organic fertilizer. Although human feces and urine as fertilizer, modernly referred to as Humanure, is just beginning to shine in this part of the globe, it has been used in China, where it is called Night Soil, for thousands of years. I have seen toilets built along the rural roads of southern China where the tank is left open for easier collection. Green Manuring is the process by which a crop, usually a ground cover, is planted and then plowed under and allowed to decompose in order to add nutrient and organic matter in the soil. Green manure crops are grown to improve the soil and indirectly improve crop yields. Plants used as green manure are generally fast-growing, herbaceous, and fast-decomposing. I'd prefer "green-manured" salad than its "humanured" counterpart...psychology seems to mess up my scientific view of the matter. The nutrients from organic materials have to be broken down into inorganic molecules before they can be absorbed by the plant. This process by which organic material is converted into forms useable by plants is called decomposition. Decomposed organic material is called compost. Soil bacteria action hastens decomposition and bacterial activity is a function of temperature. 2. Inorganic Fertilizers or Synthetic Fertilizers are manufactured from natural materials such as petroleum and natural gas. They contain high percentages of nutrient content. When applied properly at the right amount, they result in relatively fast plant response. On the other hand, it is also easy to apply too much fertilizer, causing damage to the plants. Nutrient from inorganic fertilizers is released readily in the soil varying slightly depending on the fertilizer. Since the nutrients are readily available, there is a higher risk of nutrient loss through run off or leaching. Nitrogen, phosphorous and potassium commonly known as NPK are the elements required by plants in huge quantities. Because of this they are considered the primary elements. When there is a deficiency of these elements in the soil, the plants show symptoms of abnormal growth and development. Inorganic fertilizers are classified based on their NPK components: complete and incomplete fertilizer. Complete Fertilizer is any inorganic fertilizer containing nitrogen, phosphorous and potassium. NPK are required components of complete fertilizer. Complete fertilizer comes in different fertilizer ratio which is the relative amount of N to P to K. In other words it is the proportion by which the elements are represented in the fertilizer. The fertilizer ratio can be calculated by dividing the greater grades by the least grade. A triple sixteen (16-16-16) has 1:1:1 ratio, while 30-10-20 has 3:1:2 ratio. By varying ratio farmers or gardeners get to choose the right fertilizer depending on the requirements of the plants and the condition of the soil they work with. Fertilizers with the same ratio do not have to have the same grade. Incomplete Fertilizer is a synthetic fertilizer containing one or two of the primary elements (N), nitrogen, phosphorous (P) and potassium (K). They can either contain just one element or a combination of any two of N, P, and K. These are useful for application in areas where only one or two of these three elements are deficient. Incomplete fertilizers may be combined to form a complete fertilizer when necessary. Know your plants and soil, choose fertilizer correctly. This avocado (Persea americana) plant has been in our yard for at least three years now and is doing great. It was planted by Brahms and Miriam from a seed. After this snow storm, I'll find out if it can withstand short periods of freezing temperatures. The size of the leaves is detrimental since it allows snow to collect on them. The deciduous temperate trees are better off because they already have dropped their leaves. I observed that avocado is evergreen. The snow destroyed my Calamansi (Citrofortunella microcarpa) plant. It was laden with fruits but it did not stand the snow...it snapped...again. I've always tried hard to have one in my yard but for the third time, I failed. Calamansi is a favorite fruit in the Philippines. It is a citrus plant with small rounded fruits. It has a very strong pleasant smell. It is used in cooking and as a drink (like lemonade) rarely eaten as a fruit since it is very sour. Some of the herbs in pots were brought into the garage last night for protection. The succulents are all outside still. They were covered with snow this morning but I watered them to hasten the melting of the snow. I thought that the shorter the exposure to low temperatures, the better chance they'd have to withstand cold. Tonight is still very cold. Right now the temperature is 37 degrees F and still going down. It is a good idea to bring in your sensitive plants in a sheltered area or cover them with burlap. Also protect your pipes so that they will not freeze. If you are wondering what plants are good for the fall and winter season, this is the time to make your observations. It is good to go to garden centers and see what they are selling right now. Drive around your neighborhood and see what plants are blooming or looking good right now. Even in your garden, there are things that are blooming and staying beautiful. Take note of those plants and keep a record of them in your journal. Next year plan carefully so that by late summer you anticipate what these plants will do for you in the fall and winter. Make sure that you properly prune then id necessary. Give them some fertilizer and keep them watered. They will provide color in your garden when everything else is going into their winter rest. Ivy geraniums are versatile plants. They put on flowers profusely year round and are very hardy. There are several varieties of this plant in the market so most likely you'll be able to find one that meets your choice of color. The varieties come not only in varying flower colors but also the leaves come in all shades of green. Some are glossy while others are not. These plants are perfect for planters. Keep them dead-headed, fertilized and watered. Sometimes it is also necessary to prune them as the stems tend to get woody. It is unlikely that you will kill this plant due to negligence; however, you will surely be rewarded with beautiful flowers and lush leaves if you tend to them. Roses are still blooming in my yard. The internodes are getting longer than they used to due to reduced light intensity...that's why they are taller. At this time, pruning is not advisable because it will encourage new stems or canes to come out. New stems will not be hard enough to endure the winter temperatures. For healthier roses in the spring, wait till after Christmas or later to prune. The Santa Barbara Daisy is one of the earliest flowers in the spring and one of the last flowers in the winter. It has clusters of dainty flowers that complement a lot of other plants and they are also great by themselves. This plant is great for planters and mixed borders. It is a perennial plant and it reseeds it self. Most of my plants are perennials. If you like color in your garden during this time of the year, plant some annuals in early fall. Myth: Fertilizers are plant food. Truth: Plants produce their own food. Plants are autothrops, which means they are self -feeding. They produce their own food. While humans and animals consume other living organisms to survive, plants photosynthesize. Plants contain chlorophyll that allows them to capture solar energy needed to convert carbon dioxide and water into sugars, carbohydrates and proteins that are necessary food for all organisms. If fertilizers are not plant food then what are they? Fertilizers are materials that contain one or more of the essential elements used as soil amendment. Fertilizers can be applied to the soil or by foliar application, i.e. spraying to the leaves. The essential elements become integral components of the food manufactured through photosynthesis. Without one or more of the essential elements, the plants will not be able to complete their growth cycle. That is the reason that they are called "essential" elements. Plant nutrition - refers to the plant’s need for and use of the essential elements for growth and development. The essential elements are also referred to as nutrient elements. Availability of these elements in the soil depends on soil fertility, which is the inherent capacity of the soil to supply nutrients to plants in adequate amounts and suitable proportions. The soil naturally contains all these elements but the condition of the soil determines whether such elements are in available or bound in form. To give you very simple example, nitrogen can be present in the soil but when soil moisture is limiting, nitrogen cannot be absorbed by plants. Then there is soil chemistry that determines how these elements are attached to each other. Soil acidity, better known as soil pH, plays an important role is the availability of a number of the micro nutrients in the soil. When the availability of these elements is limited in the soil, fertilization becomes necessary. Fertilization is the application of nutrient elements to the environment around a plant to meet its nutritional need. Photoperiod is the duration of daylight during a given day. Photoperiodism is the ability of any organism to detect and respond to changes in daylength. In plants this phenomenon is expressed mostly in flowering. Plants are classified into three categories depending on the number of hours of light they require before flower initiation. Short-Day Plants - plants that flower only when the daylengths are less than 12 hours. Common examples of short day plants are poinsettias, chrysanthemum, Christmas cactus, some varieties of strawberries. Long-Day Plants - plants that flower only when the daylengths are longer than 12 hours. Among the plants that fall under this classification are radishes, lettuce, spinach, potatoes, sedum, and beets. Day-Neutral Plants - plants that do not have a particular response to varying daylength. They flower regardless a long as the rest of the growing conditions are favorable. Examples of day-neutral plants are tomato, corn, cucumber, and grapes. To know the tendencies of the different horticultural crops is important in achieving desired results for the home gardener as well as the commercial grower. My backyard observation of photoperiodism. Last spring I planted cilantro and parsley. During this period the daylengths were on the rise. I observed that bolting occurred early on during the growth the plants. For these plants which are grown particularly for their leaves, bolting or flowering is anti-productive. Once flowering begins, growth is diverted to the reproductive parts of the plants and the vegetative growth ceases. I tried to deter flowering by adding more nitrogen fertilizer but that did not work. Early this fall, I planted another batch of cilantro and parsley, again. The same cultural management was applied. To my surprise, the plants continue to grow lots of leaves, and there is no sign of flowering at all. With these observations, I can say that both cilantro and Italian parsley are long-day plants. They will not flower until the days get longer than 12 hours. Photoperiod or daylength can be artificially altered in order to get a certain response from photoperiodic plants. Poinsettias for example are short-day plants which require 14 hours of continuous darkness for at least one week before they begin to flower in which the leaves change colors. Under natural conditions, this would happen only in late December. Why then do we see bright colored poinsettias for sale even before Thanksgiving? It is because all the poinsettias you see were grown in greenhouses where the lengths of days can be shortened by merely pushing a button. For the plants in an artificially-lit greenhouse, turning off the lights means that the night has begun. The cilantro and the parsley that we buy from the grocery store in the summer, on the other hand, are most likely grown in greenhouses where the dark period is long. Remember, long-day plants flower when the days are long. Herbs like cilantro and parsley are grown for their leaves. One can trick these plants to keep producing, by artificially shortening the daylength. The old black color of this blog is now changed to a softer one. I hope that the new color will be gentler to the eyes. Have fun reading my blog and gardening afterwards. 1. It can compensate for the toxic effects of other elements. 2. May replace mineral nutrient in some other less specific function such as the maintenance of osmotic pressure. 3. May be essential to some but not to all plants. Silicon increases the resistance of plants to pathogen and pests. It also increases drought and heavy metal tolerance of plants. Overall it improves the quality and yield of agricultural plants. Cobalt is essential for the growth of Rhizobium bacteria for N fixation and thus beneficial for the plant. Nitrogen fixation is the process by which the atmospheric molecular nitrogen (N2) is reduced to form ammonia (NH3). This process is carried out by nitrogen-fixing bacteria which are found in the roots of most leguminous plants. Ammonia is the form of nitrogen that is used by plants and other living systems in the synthesis of organic compounds. Affects transport of sugars from leaves to roots. Production of food (carbohydrates and sugars) happens in the leaves during photosynthesis. This food will be transported to the different parts of the plant such as the roots, fruits, new shoots, and stems. Lithium enhances the transport of such food to the roots. For the backyard gardener, there is no need to worry about artificially applying them to the soil or any growing media that you might use. Your plants will still survive. In case you want to insist, then the best thing for you to do is apply compost around your plants. Beneficial elements are not essential for plant growth. Lithium for example, is indirectly beneficial to the plant by its benefits to the bacteria rhizobium. Plants don't need the bacteria for growth. They need nitrogen. There are seventeen elements known to be necessary for plants to complete their life cycle. They are called essential elements. What Makes An Element Essential? 1. A plant must be unable to complete its life cycle in the absence of the mineral element. 2. The function of the element must not be replaceable by another mineral element. 3. The element must be directly involved in plant metabolism. Of the seventeen essential elements, hydrogen (H), oxygen (O), and carbon (C) come from the air and water and by nature, readily available. Although nitrogen can also be found in the air, its gaseous form is not useable by plants. Along with nitrogen, the rest of the elements are found in the soil. Depending on the soil properties, however, some of these elements may be present but not in forms that are useable for plant use. Still some soils may lack one or more of these elements. When one or more of the essential elements is deficient, plants cannot complete their life cycle. Such deficiency will be expressed in abnormal behavior in plant growth. For this reason, fertilizers are used to supply the elements that are deficient within the growing area. Macronutrients are essential elements that are required by the plants in huge quantities (parts/100 of dry plant matter). Macro nutrients are not in any way more important than the rest of the 17 essential elements. Micronutrients also known as trace elements are elements that are required by plants in small quantities (ppm of dry plant matter). Micronutrients should not be mistaken as less important than their macro counterparts. Scientists continue to evaluate the essentiality of more elements that are not included in the list. Nickel for example, recently won the status of an essential trace or micro element. In my garden there is one type of plant that is gaining prominence. Succulents are becoming my new hobby plant. Being heat and drought tolerant, these plants are easy to grow. They are slow-growing and they maintain the way they look for a long period of time. Their beauty is in the shape, color, and arrangement of the leaves. Some of them are glossy while others are matte and still some are hairy. So far I have a small collection of them but I intend to expand it. My collection does not include the spiny cactus. I don't intend to acquire them. The roses are already being extracted from my garden because I dislike the thorns. Heaven forbid that I should introduce a different form of those thorns. My plants came from various sources. One of my favorite varieties came from my sister-in-law's (Jennifer's) previous garden. Another one is from Pat Brown's garden. When my family went to Point Arena in 2008 for our wedding anniversary, I broke (or more accurately, stole) a branch from one of the plants near the house we rented and now I have a lot of them but I still have not found the name for it. In the mean time I will call it the "anniversary cactus". I have never seen this one in any garden center so far. The rest have been purchased somewhere. I intend to do my research to figure out the names of all my succulent plants. That is another project. I have enlisted my husband to make me some wooden boxes for these plants. He has made one so far, and I planted it this morning. The greyish green color of the leaves contrasts well with the color of the wood. This is an experimental project, and I'm curious to see how they the whole display looks when the wood ages some more and all the plants cover the soil. Monday was stormy where the rain gauge in our backyard registered 6 inches. That was enough water to saturate the ground (all air spaces in the soil is replaced with water) making the soil very loose. There was more rain than the soil can hold resulting in excessive erosion. Not only that the winds were gusty at a speed of 55mph. This combinanation of rain and wind knocked down a lot of trees, broke branches and forced the leaves off some trees even before they could show their beautiful colors. Clean Up the Yard It is a good idea to clean the yard as soon as possible after the storm. Aside from aesthetic reasons, this will help eliminate breeding places for garden pests such as snails and slugs. Slugs and snails lay their eggs in dark and damp soil such as under those layers of plant debris and of rocks. They feed on living or decaying plant material. Their eggs take from 2 months to 2 years to become adult slugs and snails. Thick ground covers are ideal hiding and breeding places for slugs and snails. In my garden their favorite places to hide are under the boxwood plants. Clearing the base of the hedges and collecting the dead leaves that have collected there make this an unfavorable place for them. Drain every container that has collected water. In my yard there pots and containers that collect water whenever it rains. If left undrained, these will become breeding places for mosquitos. Sometimes part of our gutter does not drain properly and this can become a perfect place for mosquitos to lay their eggs if the water remains there for at least one week. Checking the gutters after the storm is indeed a good thing to do after the storm. Prune Trees Make clean cuts where the branches have been broken. This will allow the trees to heal faster. When I started this blog, Mastering Horticulture, I decided to follow a simple process - to write about the activities that I do in my small garden and the observations and thoughts along the way. I assumed that this was going to be an easy process - yet I found out that the thoughts that run in my head get old so quickly. I would be gardening and see what would be good topic to write but the travel between my yard and the computer fades my desire to write about the idea. I'm therefore contemplating on carrying a small notebook and a pen so that I could write the points that I'd be interested to write about. After all, the dullest pencil is better than the sharpest mind. I blog about gardening but the irony of this is that gardening actually hinders my blogging and my blogging hinders by gardening. Help! Am I the only blogger who is trapped in this dilemma? Fortunately, gardening always wins. Blogging is a new addition in my schedule hence, I need to discipline myself. I must learn to adjust my speed in my other activities like doing laundry, cooking, studying the bible, grocery shopping, eating, cleaning the bathrooms, etc. This would lengthen my time for blogging. Blogging helps me organize my thoughts. This is particularly an important exercise for me because English is my third language. I speak Ilocano (one of the many dialects spoken in the Philippines) as my mother tongue and Pilipino (also known as Tagalog) as my second language. With this reason for my blogging, rest assured that I will persevere in blogging. Why do leaves and fruits fall naturally from the plant? Before we blame it on gravity, let us look at the role of some hormones. "Everyone must take time to sit and watch the leaves turn." Abscission is the physiological process plants go through to separate entire organs, such as leaves, flowers and fruits. This is the natural process that allows plants to discard organs to conserve their resources. Plants will develop leaves and flowers as much as they are capable to support. Sometimes environmental conditions become unfavorable that maintaining all the organs such as leaves and fruits will put the whole plant in jeopardy. It is a survival mechanism for a plant under stress. During the process of abscission, a weakened layer known as abscision zone develops at the base of the petiole. This is a layer of specialized cells that develops into a scar tissue. Here's a science fiction idea for you: Imagine that you have an unwanted conditon on your arm. You are in so much pain and becoming very weak. Without doing anything, you notice that a scar tissue begins to develop around your armpit separating your arm from your body. The separation would start from the outer layer of your skin and going deeper until every last cell that is holding your arm in place has turned into clean scar. That is called abscision; fortunately it happens only in plants. 1. Ethylene is the senescence and ripening hormone. 2. Auxin is a growth hormone. 3. Abscisic Acid (ABA) is the stress hormone. These hormones have other important functions in the plant but for the sake of explaining abscision we will focus on the above descriptions. The interaction of these three hormones results in the falling of leaves in the fall. Abscisic acid plays a role in the way plants respond to diverse range of environmental conditions. Changes in temperature and photoperiod are interpreted by the plant as stress. Under stress, the plant increases its abscisic acid levels while reducing the auxin levels. Reduced auxin levels slow cell elongation process which means that growth is minimized or stopped. The plant then shifts priorities from growth to survival until conditions become favorable for growth. In the meantime, a part of the plant will interpret the cessation of growth as senescence- ethylene levels will increase to facilitate all senescence-related processes. As the leaves stop growing, the nutrients in the senescing leaves will be mobilized to the other parts of the plant (branches, roots, etc.) depleting the leaves from nitrogen. The yellowing of the leaves is a reflection of this process. When low temperatures combine with bright sunny days in the beginning of fall, the leaves will tend to have a red tint in them. This is because the sunny days will still induce the leaves to photosynthesize but since the development of the abscision zone or the scar tissue is already in process, sugars are trapped in the leaves. The beautiful colors of the leaves after all are a symptom of a stressed plant. 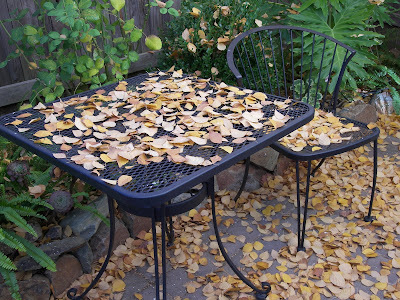 The falling leaves are a sign of a plant that is purging itself in order to survive a stressful period. Once again we've come to a new season. Fall is here. Just like the other seasons, fall is triggered by a change in the angle that sunlight strikes the earth's surface. The amount of solar radiation upon the earth known as insolation (different from insulation) determines the seasons. Plants exist to photosynthesize (produce). Plants photosynthesize using energy from sunlight. Therefore, whenever gardening is the subject matter, seasons will always be a major consideration. Change in temperature. Last week we have experienced a significant drop in temperature. Fall comes as the long awaited relief from the hot summer temperatures. Warm temperatures will still be around for a while (here in California) but the maximum temperatures will occur in shorter periods resulting in less stress for the plants. Water loss through evaporation and transpiration will also be reduced. It is wise to adjust irrigation schedule at this time. Change in Daylength or Photoperiod. Photoperiod is the length of time, expressed in hours, when plants are exposed to sunlight during a 24-hour period. Around summer solstice days can be as long as 15 hours (14 hours and 49 minutes) and from there they get shorter everyday until they are as short as 9 hours and 30 minutes at winter solstice. By fall, the change is significant enough that the plants will begin to respond. Photoperiod affects some of the processes in plant growth including germination, flowering, tuberization, and abscission. Plants are sometimes classified as either short-day, long-day, or day-neutral depending on the daylength that is required to initiate their flowering. In the Philippines (where I grew up), there are only two seasons in a year: the wet season and the dry season. Although rains come throughout the year, some months are a lot wetter than some. Throughout the year temperatures are always high because the Philippines lies very close to the equator and gets almost the same insolation throughout the year. "In the middle of every difficulty lies opportunity." This is a picture I took from one of our camping trips to the Bay Area. It is a picture of a tree, an old tree that has gone through all sorts of stresses. The trunk is hollow, animals already found a home in it. Sooner or later the tree will die. But against this gnarled grotesque trunk comes a fresh new growth with lots of promise. Herbs are plants that are used to add flavor, color, or spice to food. They are easy to grow and require a relatively small space to grow. While some herbs are grown for their medicinal value, mine are grown them for their culinary value. They come in different colors, shapes, and height that they can be ornamental at the same time. In my garden, I like to plant herbs that I use in my cooking. Rosemary, sage and thyme are perennials. Perennial plants come back year after year. They need to be trimmed from time to time to control their shape or to encourage more branching. Annual herbs like basil and cilantro complete their life cycle within one season or one year after which replanting is necessary. Sometimes their life cycle can be delayed by cutting removing the flowers. This works weel with basil. Mint is also a perennial plant but here is a word of caution: Mint is invasive and can become a weed. To prevent it from becoming a problem contain its growth by planting it in a pot or a planter box. Chives has its own special feature. It is a perennial and self seeding plant. Not only does it come back year after year, it also spreads its own seeds. Unless the flowers are cut off before they mature, chives can also become a weed. Yesterday I bought some cilantro and parsley seedlings. There are three seedlings in a pot so what I normally do is to spread the seedlings apart into a bigger pot to allow more room for each plant to grow. I like to plant them in pots so thatI can move them around. When it is too hot I move them to a place where they get more shade. As the cooler months approach I will be moving them so they get more sunlight to compensate for the shorter days. The California temperatures will gradually decrease and by the time temperatures become limiting to plant growth it will be December. I thought that the pear tree, Pyrus communis, in my bakyard was Anjou but this year it I concluded that it is Bartlett. One of the most distingishing characteristics of Bartlett pear is that they change color from green to golden with a hint of red as they ripen. They have a smooth and juicy texture. I also found out that the flesh disintegrates easily when being cooked making it a good candidate for making pear-sauce and pear-butter. One problem I need to deal with next year is pear codling moth, Cydia pomonella. To demonstrate my point regarding the importance of having a scientific name for all plants, I asked my son to take this picture. 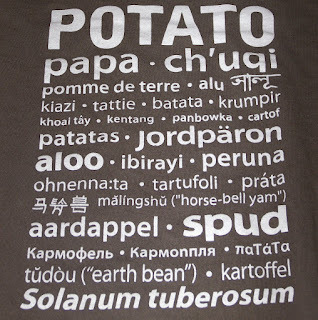 This is a list of the many names of potato throughout the world. Each region in the world has a common name for the potato, however there is only one scientific name for it throughout the universe - and that is Solanum tuberosum. My family and I could be seen sporting a T-shirt with this picture on it. All of us got one for a present from our dear friends, the Vander Zaag family, when we visited their place in Alliston and their potato farms and storage. They operate a larde scale potato farm that supplies Lays Potato Chips among others. I give special credit to the Vander Zaags for this catchy and wearable design that puts the concept of scientific nomenclature in perspective..
A long time ago, when plants were only found in their original habitat, each plant had one name. Then there were explorers who went to far away unheard-of lands and they carried back their discoveries to their country. Among the important commodities that they got were plants. Then with the commercial airliners people smuggle plants from places that they visit and vive versa. Although this illegal operation is almost impossible to do now with the Homeland Security and Immigration Department in place, some still try hard to do it because it is part of human nature to acquire and share the good things in life. Once they are in a foreign land these plants were then given other names. The plant that was once called papa originated from the Andes Mountains of Peru. It has been brought to far away places throughout the world. In France, this same plant is called pommes de terre, in India it is called aloo, in the Philippines it is patatas, and so on. You can see how this can be very confusing when we read literature. Scientific Name: Solanum tuberosum L.
Solanum is the generic (genus) name. Genus is the name given for a group of plants/organisms with physical characteristics that are similar and permamnent. It always start with a capital letter. Solanum describes a group of plants that have the following characteristics: lightly to heavily toxic; clammy to hairy plants; star to bell shaped flowers with five lobes; and fruit is always a berry. Examples of plants in this genus are potatoes, eggplants, tomatoes. tuberosum is the specific name (epithet). Species may be a noun or adjective. It is written in th elower case. It may be s distingushing characteristic of the flower as in grandiflora (meaning big flowers); a location of discovery as in philippinensis (from the Philippines) or montpeliensis (from Montpelier); or it may honor a person's name as in Davisii for Mr. Davis. tuberosum refers to a group of plants that develop tubers. Both the generic and the specific names are written in italics or enclosed in a parenthesis to indicate that they are based on a foreign language. The L. stands for Linaeus (Carolus), the person who named this plant. If Miss Helen Taja were to name a plant she would have to add the letter T after the generic name so that everyone will know who named it. Perhaps this is a priceless reward for doing your part in naming all the creatures that God made. After all this was the first job that man had. Adam in the garden of Eden was instructed by God to name them all. So what is in the scientific name of a plant? It is a picture of the distinctive characteristics inherent to the plant being named. It rained last night and today everything looks greener than yesterday. The rain gauge in my backyard registered 0.25 inches. This amount of rain is not substantial enough to reach the root zone. So don't stop watering yet. However, it is sufficient to wash off the dust that have accumulated on the leaves allowing the leaves to get high definition radiation from the sun. It is also enough to cause a dramatic change in the humidity in the immediate surroundings of the plant (microclimate). An increase in humidity results in a decreased rate of transpiration. Transpiration is water loss through the leaves. As a result, more of the water available to the plant (within the root zone) will be used for photosynthesis instead of being transpired. The term horticulture comes from two Latin words namely: hortus (garden) and colere (to cultivate or tend). Simply horticulture means "tending a garden" or just gardening. As a field of study, horticulture is the science, art, and business of growing and marketing fruits, vegetables, flowers, and ornamental plants. The crops studied in horticulture are those that require more intense and constant care. These include but not limited to ornamental plants, cash crops and hobby plants. Therefore a crop is considered horticultural depending on the purpose that they are grown. For example, wheat (Triticum aestivum L.) is a low-input crop and is traditionally grown for their grains on big acres of fields - it is considered an agronomic crop. When wheat is grown as wheatgrass for their wheat juice (like the green stuff you get from Jamba Juice) then it is considered a horticultural crop. Horticulture involves two main types of plants: Plants that are grown for food are called edibles while plants grown for aesthetics are ornamentals. There are several number of sciences under these two categories which I will discuss as we deal with them in the future.